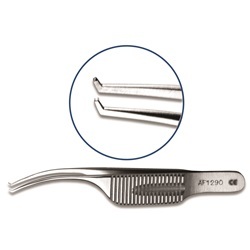 Colibri style corneal forceps that are available in both stainless steel and titanium options. 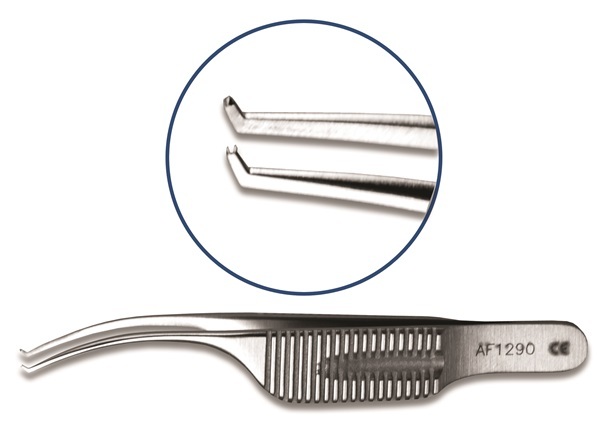 Forceps have curved shafts and various tip sizes with 1 x 2 teeth sets. Flat handle. Overall length: 76mm. 0.3mm teeth set at 90 degrees, 6mm tying platform. 0.5mm teeth set at 45 degrees. 0.12mm teeth set at 45 degrees, 4.5mm tying platform. Titanium, 0.12mm teeth set at 45 degrees, 4.5mm tying platform. 0.12mm set at 90 degrees. Titanium. 0.12mm teeth set at 90 degrees.